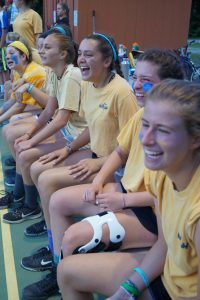 As dinner came to a close tonight, our oldest girls stormed into the dining hall decked out in blue and gold to announce that they would be battling Laurel South in our first ever 15U girls basketball game under the lights. 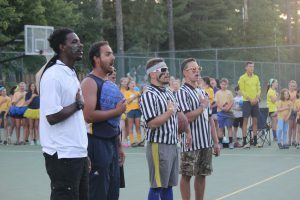 As the lineup was announced, complete with hilarious nicknames, the entire camp erupted into cheers. 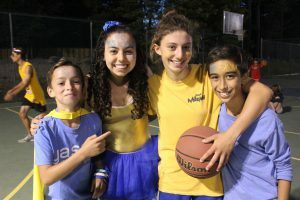 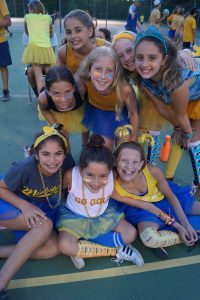 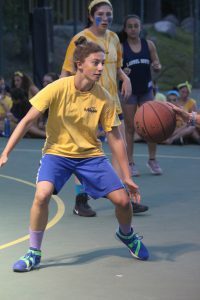 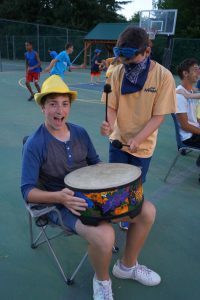 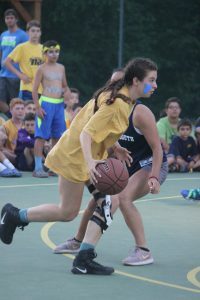 Once we all left the dining hall to change into our blue and gold, campers met for pep rallies and face painting to get into the spirit of the game. 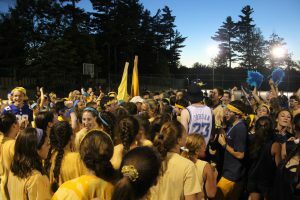 We all gathered on the court and took our places as we awaited tip off. 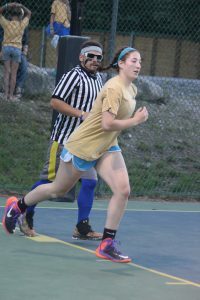 Paying homage to Taylor University’s annual Silent Night game, Micah silently watched as the 15U girls racked up point after point. 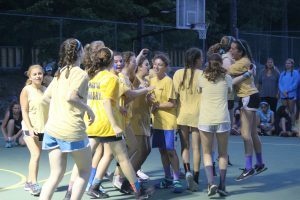 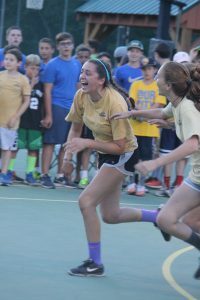 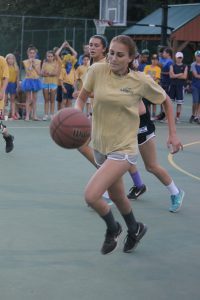 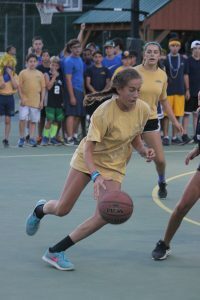 As the 10th point swooshed through the basket, the entire camp exploded into cheers and insanity…including a Summit Cheer Squad storming the court. 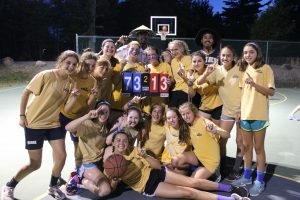 The cheers didn’t stop as we eventually finished the game with a score of 73-13. 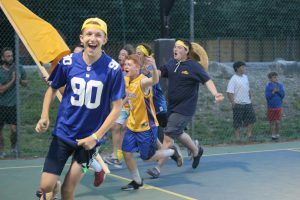 The spirit at camp was so contagious that even our opponents got into the mood as we cheered them on as well. 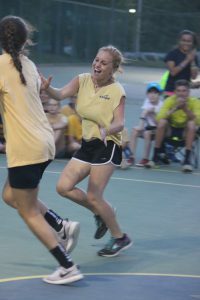 Despite their loss, Laurel South players declared that it was their favorite night of the summer. 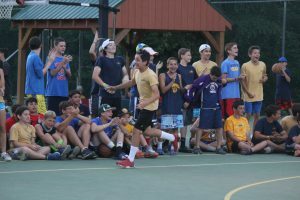 The two teams met in the Dining Hall after the game to break bread (aka Chipwiches) and then the Micah team took a victory splash into the pool. 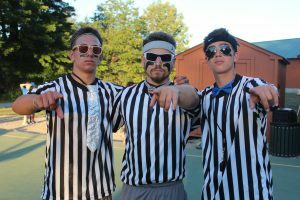 Tonight is a night that will go down in Micah history!